Since my last post, our new house has come quite a long way! The lot has been cleared, framing is complete, and the groundwork for plumbing and electrical is almost finished. While the builders have been hard at work, there really hasn’t been much to see from the outside, but I think that’s about to change once they start putting up drywall in the coming weeks! In the meantime, we’ve been having a great time working with St. Clair Kitchens to finalize the kitchen layout, cabinetry, and make sure it all works with our appliances. I never realized there were so many options when it comes to types of cabinets, drawers, organizers, and inserts. One of the first decisions that we had to make was whether to have one, two, or no windows on the stove wall. We decided to go with two so that the kitchen is airy and bright. Adding two windows also really makes the range and hood a focal point on that wall. Another major decision was the size and shape of the kitchen island. I dreamed of a wide island with large pendant lights and 3-4 barstools lined up facing the stove, but the space was really just too narrow so we ended up needing to turn the island longways. Now that it’s framed, it’s starting to feel real, and we’re so excited to have enough space to have our friends and family over for a proper meal, and to have adequate storage to keep our kitchen organized. Another change that we decided to make was removing the wall between the “his and hers” master closets to create one large master closet. 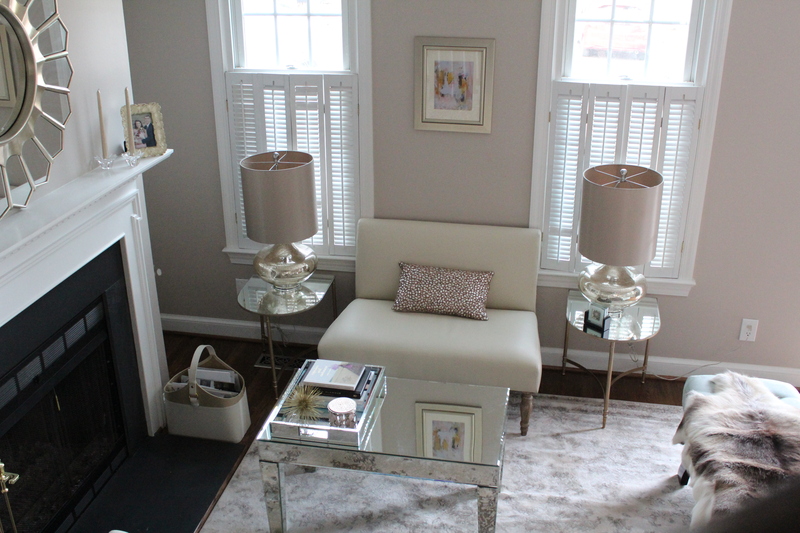 We also shortened the windows to allow for built-in drawers for accessories and such underneath like in Rachel Parcell’s amazing closet designed by Alice Lane Home. While our closet will be no where near as large, and I won’t be able to fit my desk inside, I hope we’ll be able to have separate storage areas for short and long dresses, skirts, blouses, and a shoe wall! Since the plans were already in place when we signed our contract on the house, we haven’t made too many structural modifications to the original plans, but will get to pick out almost all of the finishes from tile and countertops to paint colors and light fixtures…more on that coming soon! This snow day has me thinking about being cozied up in a nice, warm, bed. We recently purchased new bedroom furniture since we had been using a bedroom set that I picked out in high school. While it had seen us through many moves, it was time for something new, and I was able to pass it along to my little sister, who is starting off on her own. Quality furniture can be handed down, so I knew I wanted to invest in a new dresser and mirror for myself, and storage chest for Ted. I settled on the dresser and media chest from Bernhardt’s Salon Collection. Ironically, the ivory and gold is reminiscent of a bedroom set that my mother kept for years and years, despite me telling her it was outdated. The Salon Collection is a fresh take on a classic combo. I would absolutely love to do wallpaper in our bedroom, but we plan on selling our house in the next couple of years, so I don’t think it’s worth the investment. 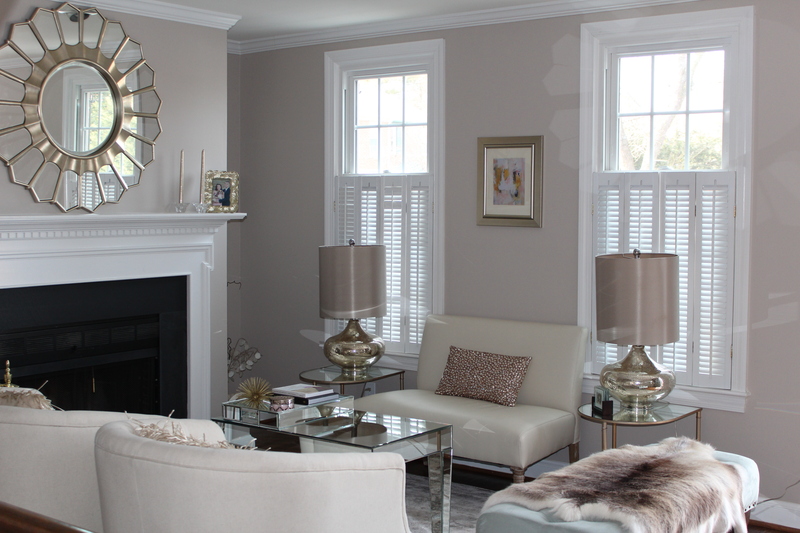 Our walls are a custom grey-taupe, almost identical to Benjamin Moore’s Revere Pewter. I love textured neutrals, especially for investment pieces, but am looking for ways to inject a pop of color (though not too much since I still want it to be a tranquil and relaxing space). 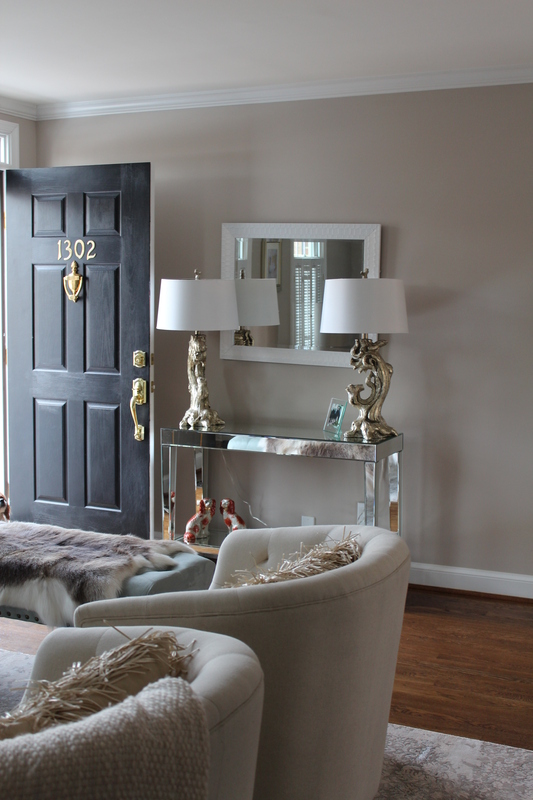 The color palette is shaping up to be cream, gold, and muted lavender to pick up on the bit of color in the rug. Would love ideas for art and other accents to bring the space to life, as well as bedding that feel hotel-worthy! Ted likes to joke that I went through three cribs when repurposing our guest bedroom into a room for the baby. It was actually only two…I quickly realized that as precious as a wall to wall Pottery Barn Kids nursery can be, it was a little too cookie cutter to mesh with the overall design aesthetic of our house, especially since the room is so small and the crib is truly the focal point. 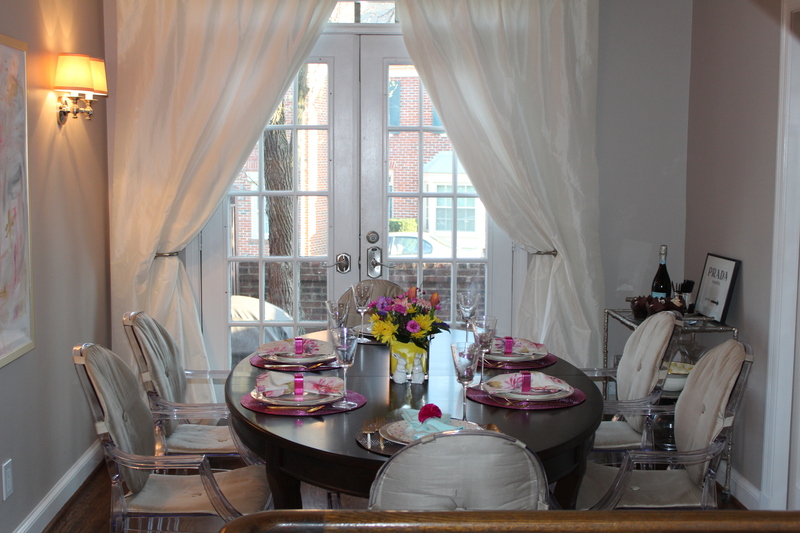 I had been noticing a trend of wrought iron cribs popping up on blogs here and there and discovered that one of the most popular companies, Bratt Decor, is actually a family-owned business based in Baltimore, just a short drive away from where we live in Alexandria. As coincidence would have it, they were gearing up for a warehouse sale so of course I made my husband give up a day of golf to see what we might find. We were delighted to snag a crib that was being discontinued at a discount! We picked out the “Venetian” in “pewter”. It comes with a canopy kit that we decided not to use at first, but that Ted insists will be the framework for a “fort” once we convert the crib to a toddler bed. Since our house has hardwoods throughout, we also felt that a plush rug that covered most of the floor was a must given all of the crawling around on the floor that is sure to be in our future. I spotted the Loloi “Penny” rug (also called the “Panache”) in mist on Joss & Main and quickly placed my order before the last 2 sold out. 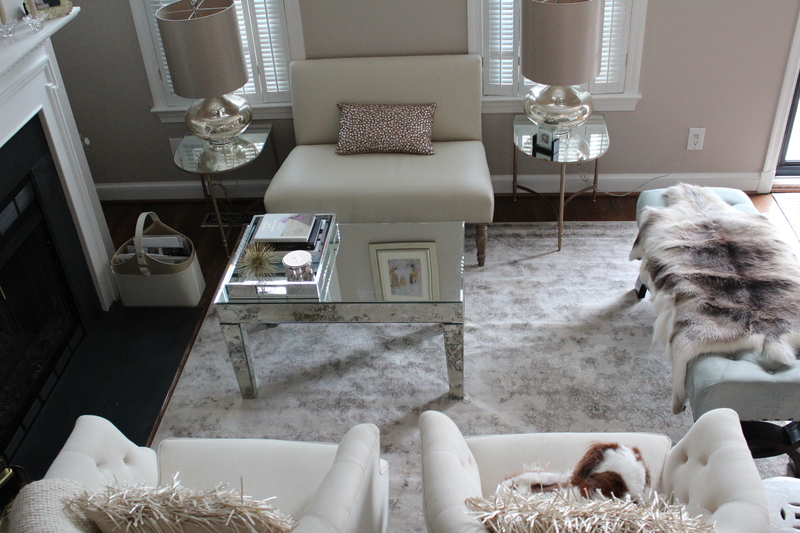 I liked the silvery blue tones, and that it looked like a rug that I could just as easily place in the living room. The crib and rug set the tone for the silver and blue hues, and were our investment pieces, even though I managed to get a good deal on both. From talking to friends and new moms, it seemed that a “glider” was a must have item, along with a changing area, so these were where I focused next. Meanwhile, Ted installed crown molding, a ceiling fan, and a new closet system to replace the old particle board built-in that was original to the house. I picked out the “Reese” grey and white animal themed crib bedding set from Pottery Barn Kids along with a few plush pieces like the Elephant Plush Play Mat and Sherpa Bear Rocker (which we received as a generous gift from dear friends). 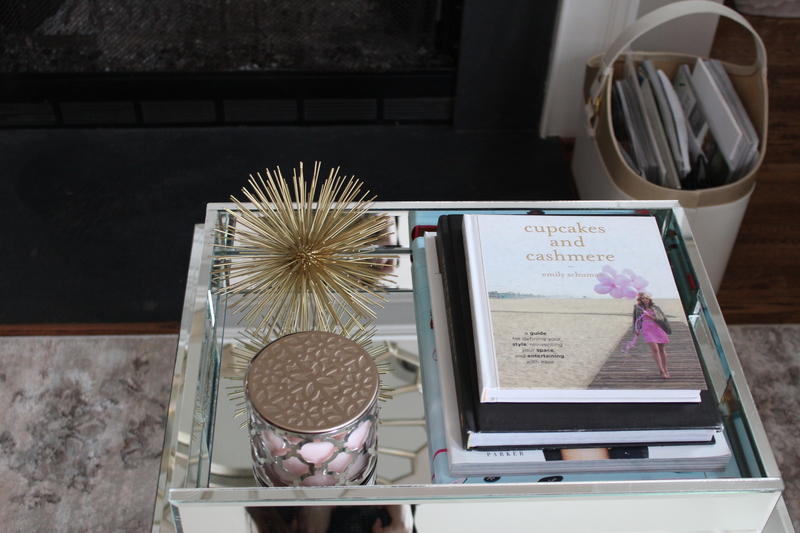 To add a bit more blue to the room, I ordered a storage ottoman from Wayfair and fabric swatches from Carousel Designs. I chose their Robin’s Egg Blue for the drapes, changing pad cover, and a spare sheet. Once all of the large furniture items were in place, I collected a few finishing accent pieces during my regular trips to Homegoods, and hope that we now have a baby room that is comfortable for late night feedings, afternoon playtime, and functional! Thanks for reading! I would love to know what your must have items are for a baby/toddler room as well. When we first moved into our house, the walls were a dingy butter creme yellow framed with off white trim on the windows and accent woodwork. 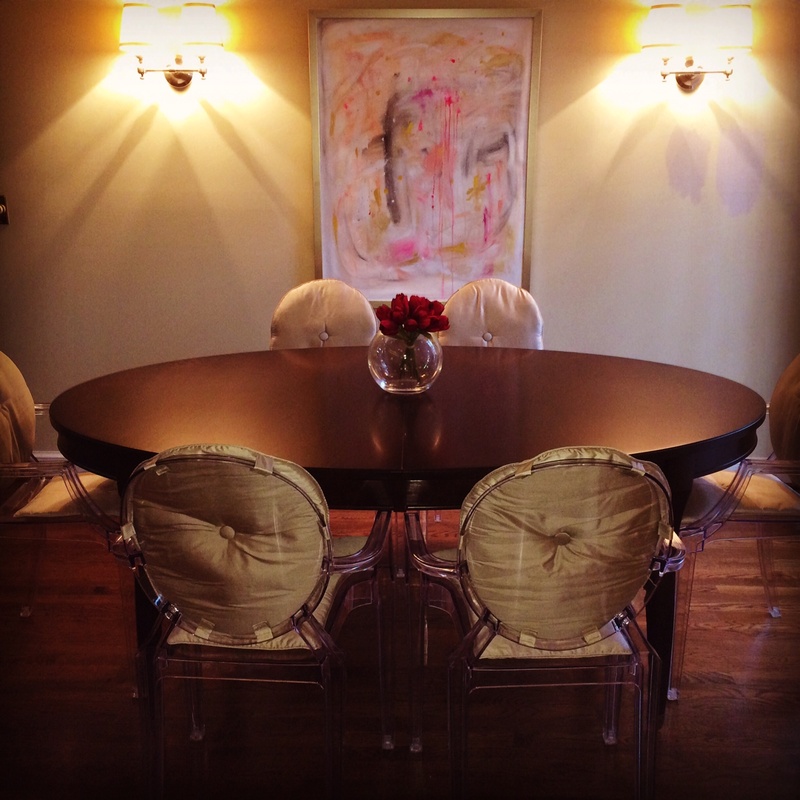 It just gave a dated, nineteen-eighties feel to the room no matter how many modern pieces and metallic accents I added. After countless trips to The Home Depot to find the perfect paint color, I finally settled on this warm gray custom shade that is an exact match to the rim of my china, Femme Fatale by Monique Lhuillier for Royal Doulton. 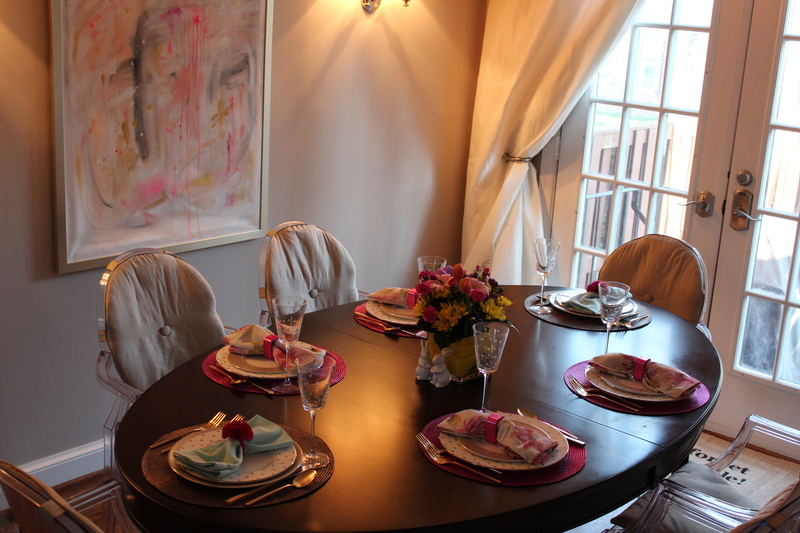 I then set to work scouring Homegoods, Overstock.com, and One Kings Lane for furnishings and finishing touches. 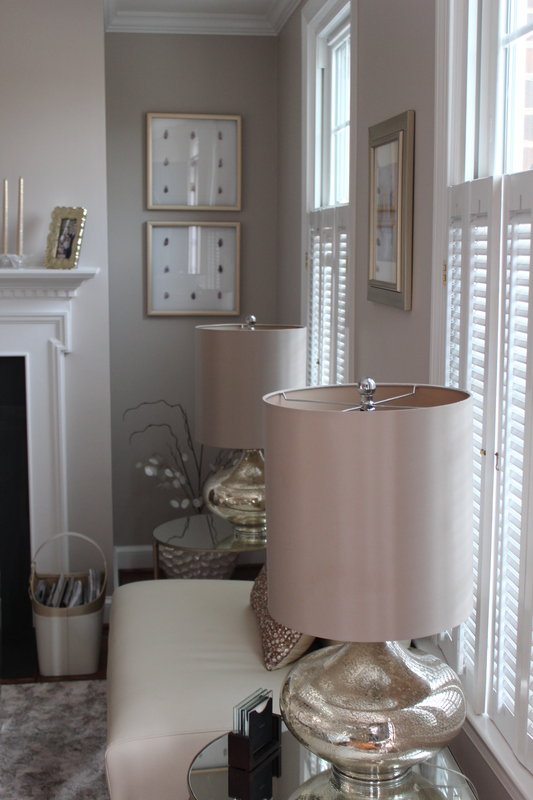 I tend to favor textured neutrals because they have a timeless elegance and never go out of style. 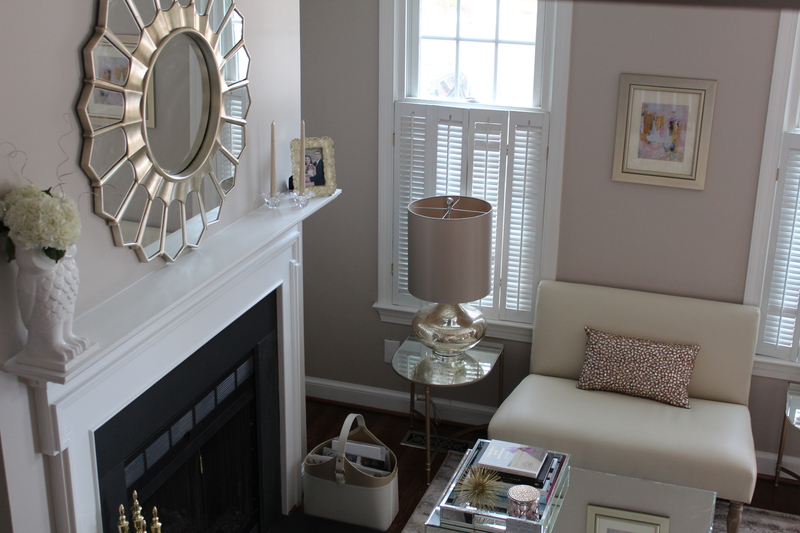 It’s easy to switch up accent pieces for a bit of color from season to season. 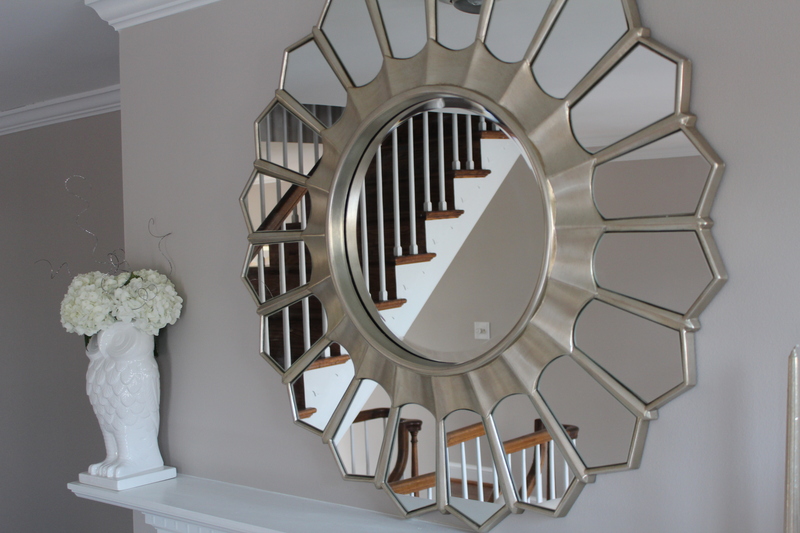 My favorite piece in the room is the sunburst mirror from One Kings Lane that hangs over the fireplace. It’s a stunning focal point, and just fills the room with reflected light. I’m also pretty proud of the framed amethysts that I found broken and banged up in the clearance section of Homegoods. With a little effort and elbow grease, I was able to bring them back to life. 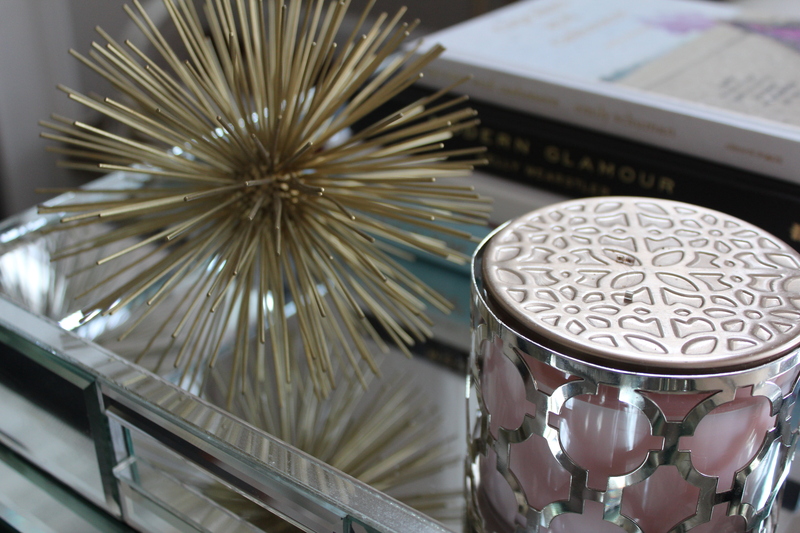 Where are your favorite shopping destinations for home decor? 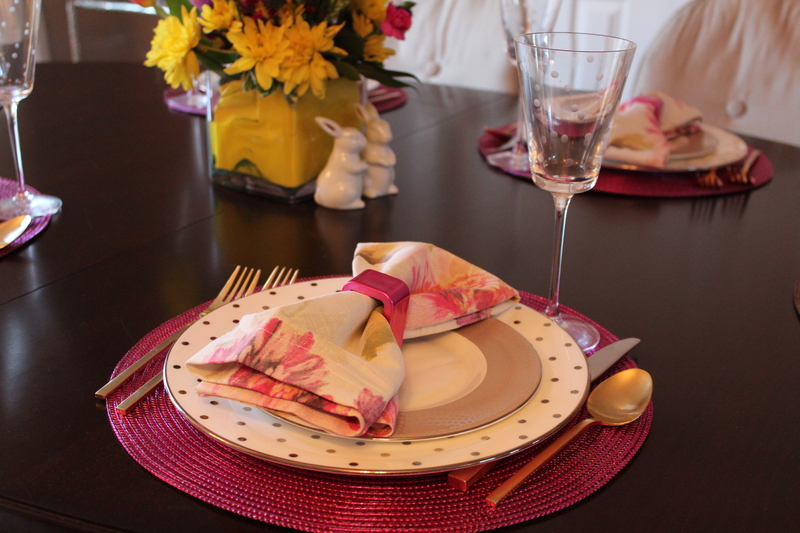 In decorating the table for Easter, I let myself have a little fun mixing and matching colors, patterns, and textures to create a bright and energetic spring tablescape. 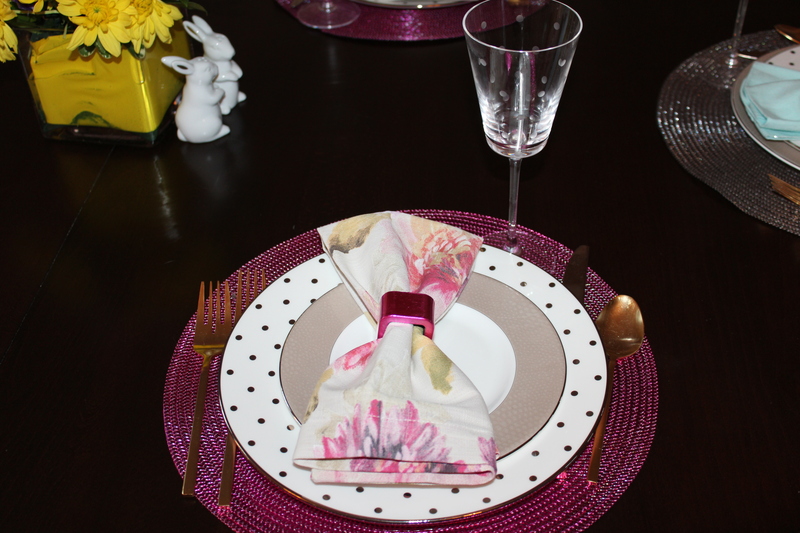 I found the Nicole Miller Home floral napkins at Homegoods and just had to use them, but could only find four. 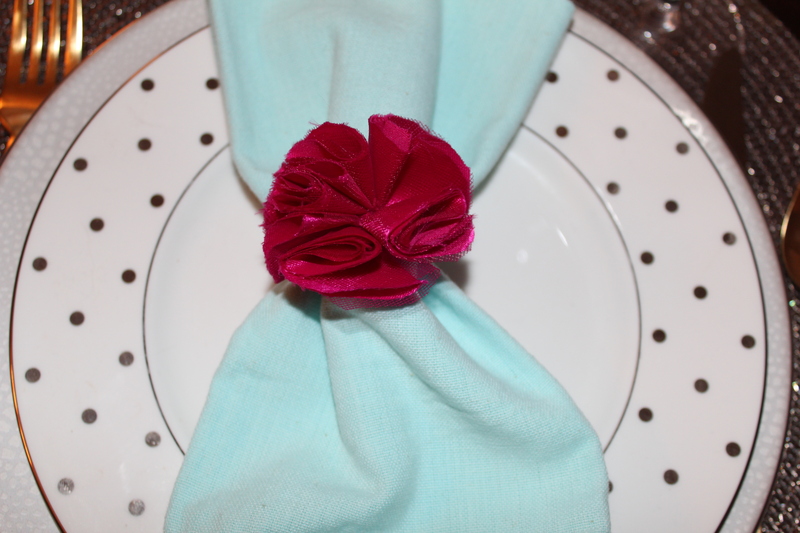 I also realized that I had donated my go-to “Mint Candy Apple” hued placemats in our move last year. Luckily, matchy-matchy is out and pattern play is in! 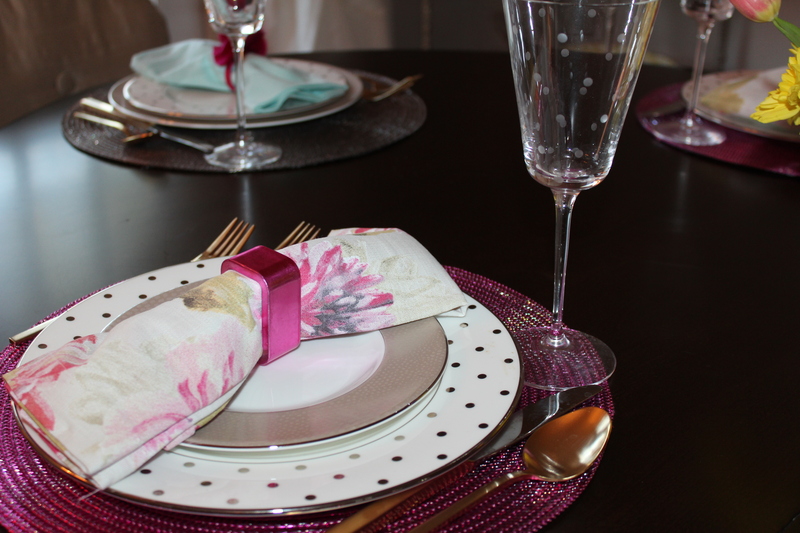 I started with the napkins and the pieces that I knew I could use throughout to keep the table cohesive and played around with different combinations and finishing touches. 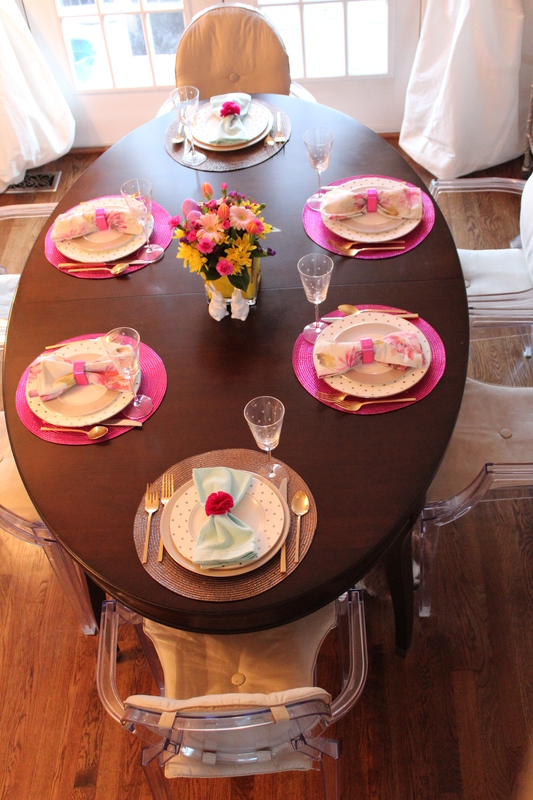 Since my table is oblong rather than round, I chose to have the ends of the table set the same instead of alternating the two place-settings as I would around a round table. The finishing touch was the pair of adorable bunny salt and pepper shakers. 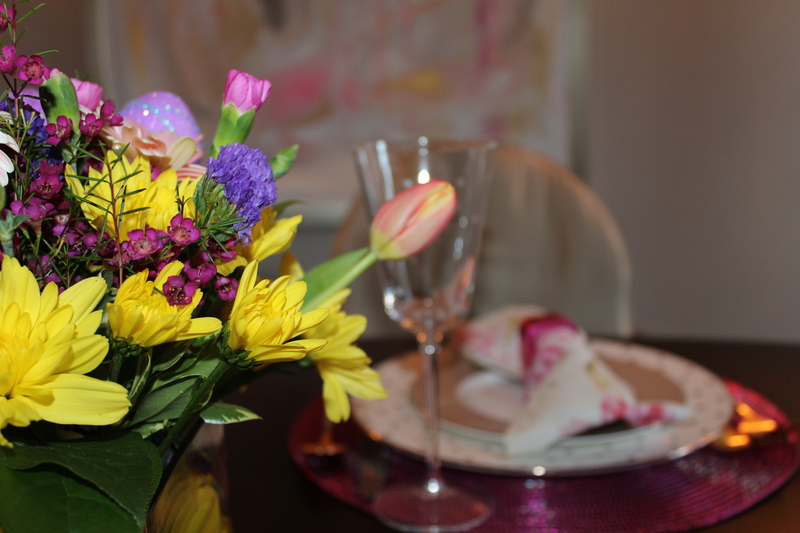 What makes your Easter table complete? I was so excited to have a Christmas tree again this year after not having one the past couple of years. I’m not the Grinch; it’s just that last year we were moving into our new home 4 days before Christmas. The year before, I donated my poor little 5’ unlit artificial tree to a military family and told myself I was taking a more modern approach by showcasing our ornaments in the apothecary jars from our wedding instead of cramming a tree into our small apartment. 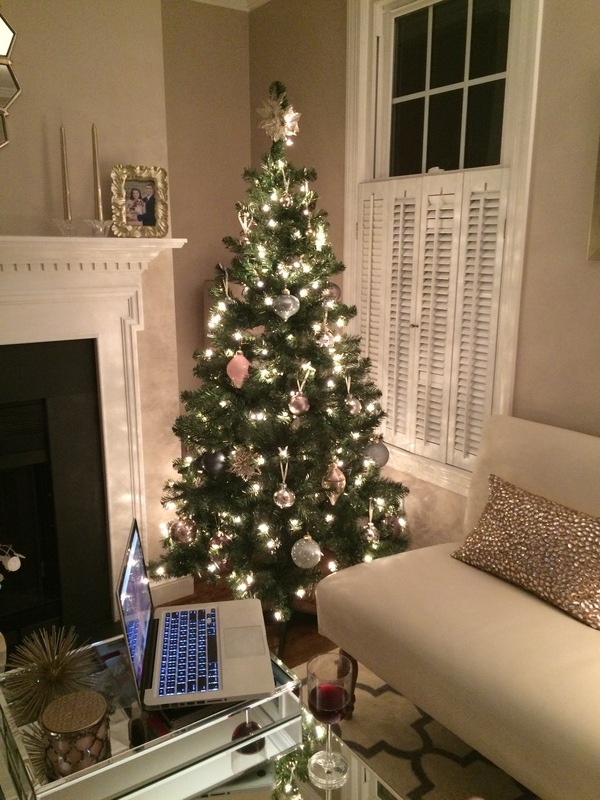 Now that we’ve settled into our home, I’ve loved having a Christmas tree again. It gives off such a pretty glow and lends a festive feel to our living room. 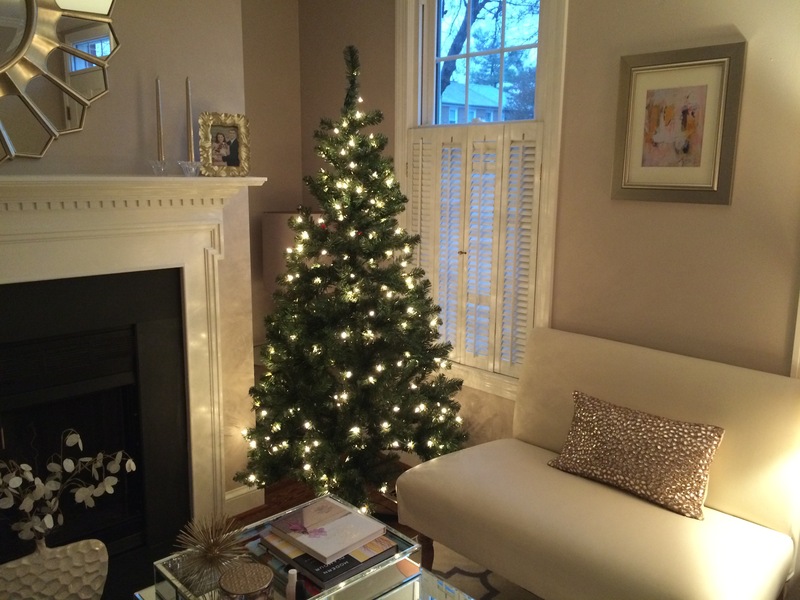 The first debate was to have a live tree or artificial tree, but with having a small dog and 2 fireplaces in our house, I opted for an artificial tree for ease and safety…I also didn’t want sticky sap all over our hardwood floors. In the name of convenience, I am also thankful that my tree came pre-lit as stringing the lights can be the trickiest part! Once I assembled the tree and fluffed the branches (outward and upward according to the box), it was time to hang the ornaments – my favorite part! I even went a bit overboard and bought a few too many for my fairly small 6.5’ tree. They were all so sparkly and pretty in the packaging that I thought I would have a hard time figuring out which to use first, but I cranked up the Mariah Carey Christmas songs and got to work. Starting with the larger ornaments, I placed my favorites toward the front and most visible sides of my tree, and used the remaining ornaments to fill in on the backside for balance. I noticed myself spacing like colors and shapes evenly around the tree and alternating to try not to have two ornaments of the same shape or color side by side. 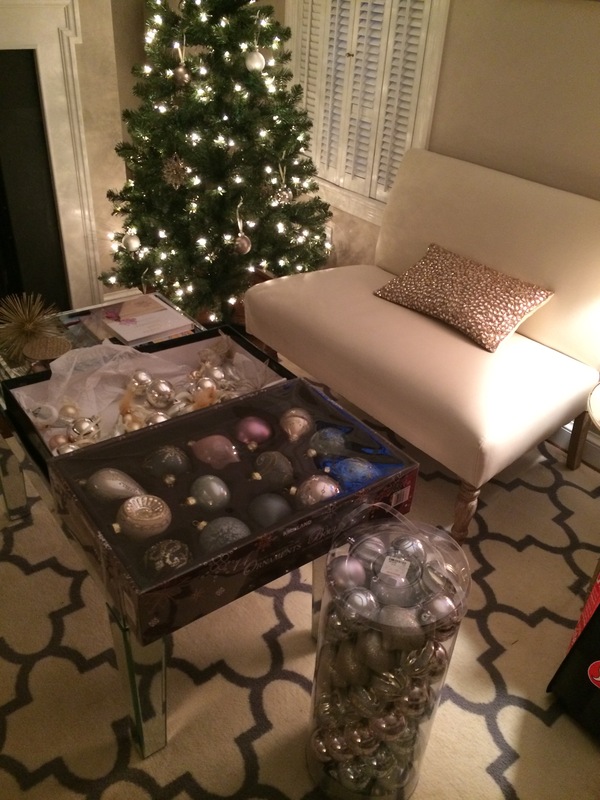 To finish things off, I filled in open areas with the smaller classic round glass ball ornaments, this year gravitating towards the champagne and silvery colored ones more than the gold and white ornaments in the collection. I really liked how the large pink and charcoal ornaments complemented the charcoal grey pattern our rug and pink hues in the framed art and beaded throw pillow. Since I still had ornaments that I didn’t use on the tree, I dusted off my apothecary jars and filled them with the remaining ornaments to use as festive accents around the house such as a dining room centerpiece and as a little holiday sparkle on the mantle.